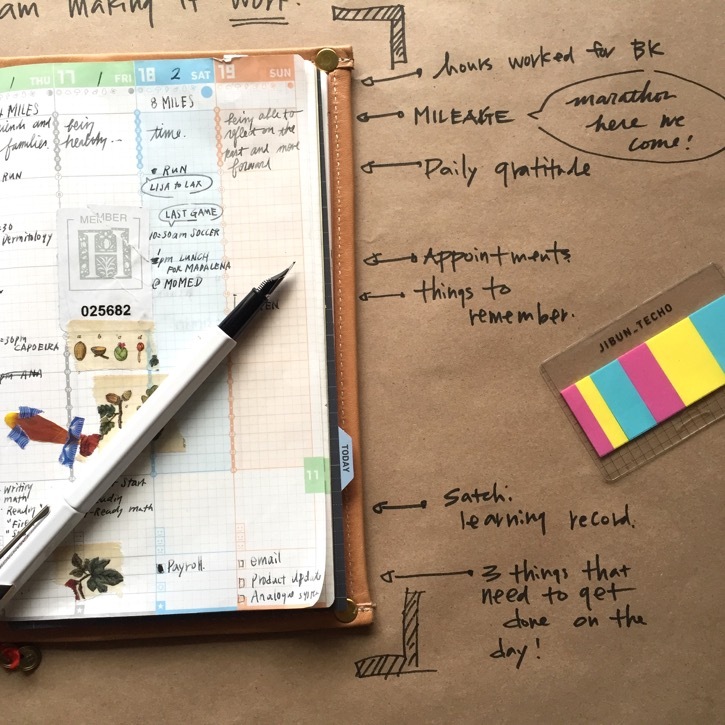 Home » BK Journal by Wakako » How I am making "Jibun Techo" work for me! How I am making "Jibun Techo" work for me! We started introducing Jibun Techo for 2018 this season and since it's a relatively new planner system, I get a lot of questions reg. how I am utilizing the notebook. So here it is. My visual guide to Jibun Techo weekly spread. 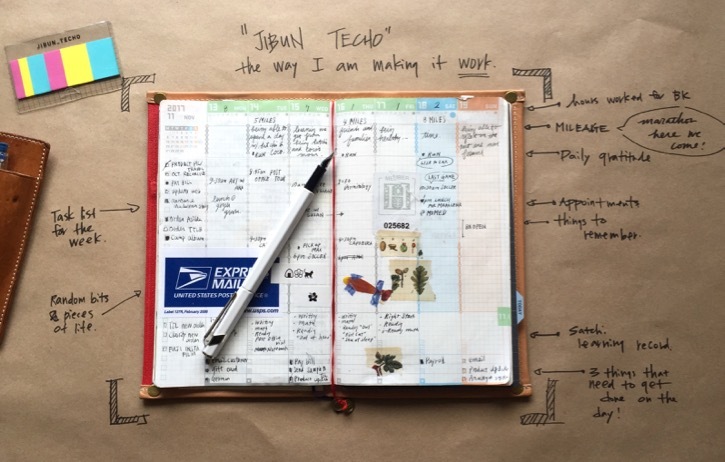 Here are my favorite features of the Jibun Techo. I adore Tomoe River paper so much for their tactile and writing quality. I use fountain pens, ballpoint pens, and pencils on my Jibun Techo and they all work great on the paper. The weekly layout has flexible yet consistent structure and it's so easy to dedicate specific elements and needs for the spread. Since I use this planner for everything in my life including appointments, BK, homeschooling, marathon training, etc. etc... I decided to use different rows of the weekly spread for what is relevant to my every day. So instead of documenting today's mood, weather (which are available to document as pre-set layout if you would like), I use the rows for hours I worked for BK, mileages I run for marathon training, morning gratitude, appointments, homeschool learning records, today's task list, etc. I love the being able to mix and match pretty much everything I need to document, remember, plan for each week. Every Sunday, I write down (and migrate) the week's schedule and to do list for the week. It's so handy to have them written on the same page as my weekly spread. Life can be complicated for all of us... and planner system doesn't have to be. I haven't really used the project tracker pages yet. It's something I might incorporate when I start working on a larger scale BK project (which is in the planning phase now!). I have one list page dedicated to blog/story ideas and did use the book list available. I think I will need to convert some of the preset task lists in 2018 planner to my own lists so they are more useful. 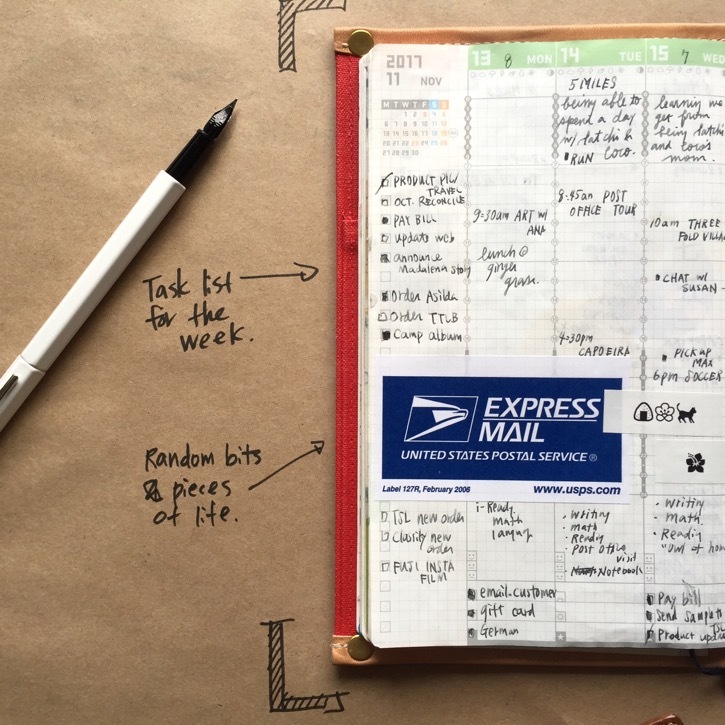 I carry the Jibun Techo Underlay Mat (love the "today" tab) as well as their Sticky Notes which I am so in love with their minimalistic design. And currently, my Jibun Techo is housed in our [TSLxBK] Original Cover. We are taking pre-orders for the upcoming production that is expected to be delivered in early 2018! And yes. We are making a prototype for B6 slim size right now and as soon as we approve the design, we will start taking preorders. If you have any thoughts/questions/ideas, please shoot us an email. I would love to continue incorporating your question into the stories we share! Now let's make the end of 2017 amazing, shall we?